Here's a word of advice from Team UU: If you're planning to rob a bank, make sure your relatives are in for a cut. Because if they aren't, they will be faster than Usain Bolt when they start making calls to the FBI's tip line to turn you in. Such is the case with alleged TCF bank suspect "Uptown Beach Bandit," who had two relatives call the FBI to ID her from surveillance photos. 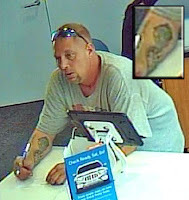 And such is the case with Justin Damm, the guy with the distinctive tattoos and no attempt at a disguise whatsoever, who is accused of robbing the PNC Bank at Montrose and Broadway in Wilson Yard on August 19th. The robber even had sunglasses with him -- which he perched on top of his head instead of using them to slightly obscure his face. According to the FBI, as quoted in this story in Oak Lawn Patch, Mr. Damm got $702 from his heist. The very next day, one of his relatives contacted the FBI after seeing his photo on the news. Mr. Damm turned himself in to the FBI on August 24th. You can read more details in Oak Lawn Patch. Oh, and he's from far south suburban Alsip, in the faraway land where addresses have five numbers in the street address. Why is everyone coming to Uptown to act out? Go home, folks. Shop, shoot and rob closer to home, 'kay?